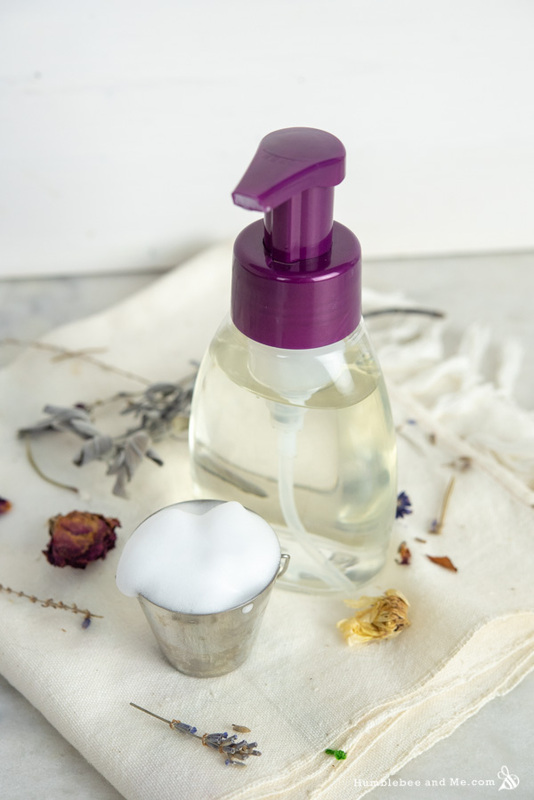 Today we’re continuing our “soothing” series with a super-simple Soothing Foaming Hand Wash. I wanted to be sure to include a hand wash in this series because our hands take a ton of abuse in the winter. Frequent hand washing is great for preventing the spread of the cold and flu, but it’s also great for drying out hands, leaving them feeling tight and irritated (or worse—cracked and bleeding). This hand wash features a gentle blend of surfactants and some soothing ingredients to help you keep your hands clean and happy as we seem to inch towards peak winter dryness. Let’s start with our surfactant blend; it’s a combination of amphoteric Cocamidopropyl Betaine and anionic Sodium C14-16 Olefin Sulfonate (Bioterge AS40). We combine surfactants with differing charges to create a milder blend, which is always good! Both our surfactants are derived from coconuts, and come together to give our end product a total active surfactant matter of 4.35%—nice and gentle. They’re also both liquid, which makes them really easy to work with. 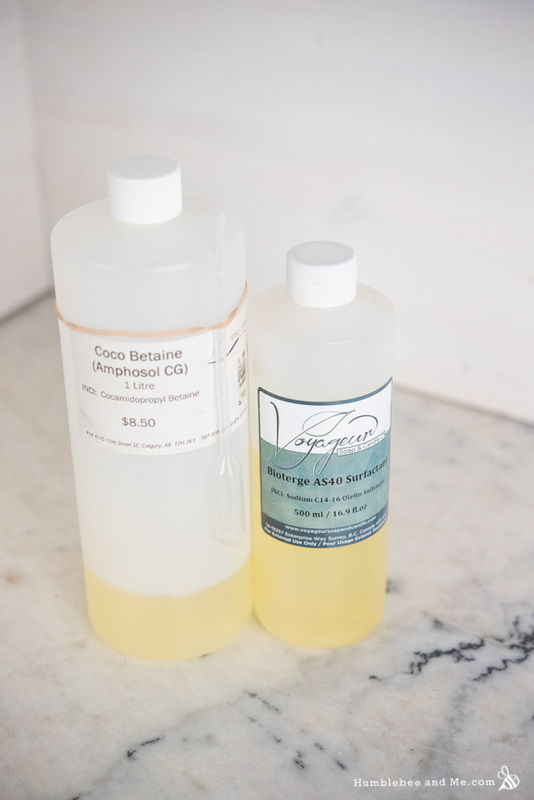 I’ve included lots of vegetable glycerin to add some moisturizing goodness to this hand wash, as well as some soothing panthenol (vitamin B5). If you compare the ingredients in this recipe to the other recipes in our soothing series you’ll find I’ve dropped a lot of the more expensive ones (there’s no hyaluronic acid in here!) because this is a wash-off product. 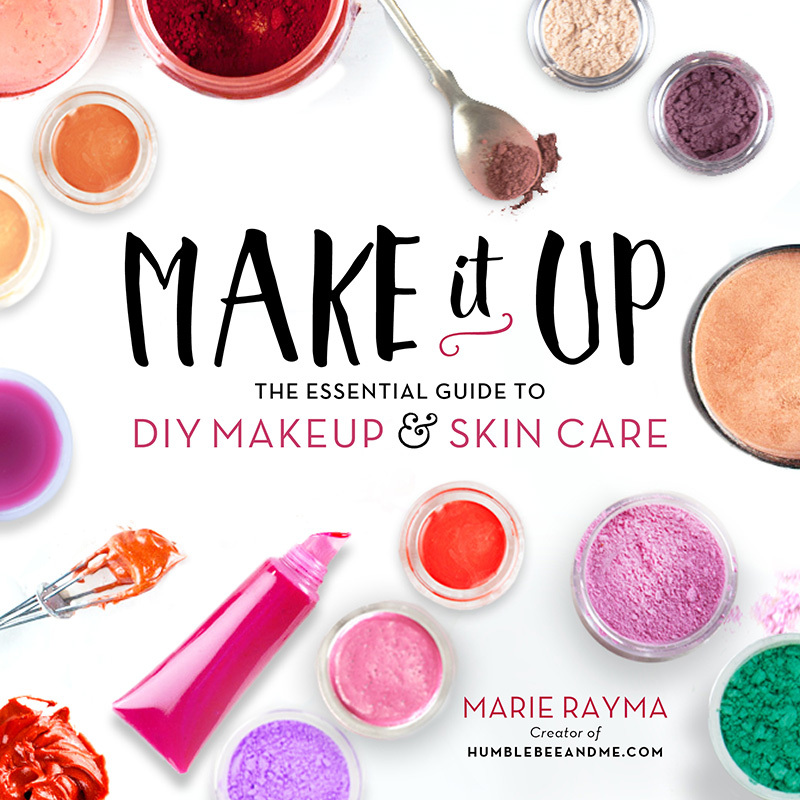 There’s no need to waste pricey ingredients on something that goes down the drain pretty darn quickly—let’s save those for leave-on products where you’ll get more bang for your buck! Our scent comes from a bit of cucumber distillate. I find it to be a really strong scent, so I just used 7% and I find that’s more than enough for a hint of cucumber-y goodness. You could also include some chamomile hydrosol if you like—it’s up to you! Some aloe vera and water round out the mixture, along with our preservative. 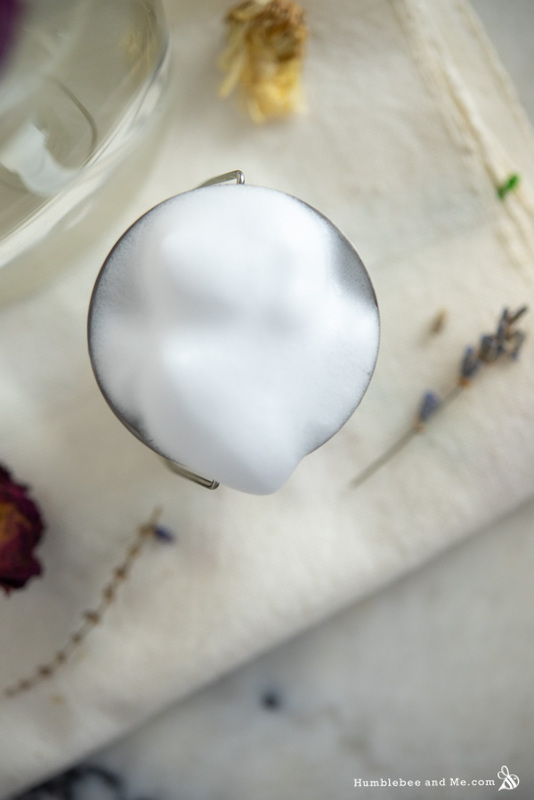 Weigh the two surfactants into a small heat-resistant glass measuring cup and stir to combine—they’ll become quite thick! Add the vegetable glycerin and panthenol, stirring to combine. Now is a good time to break up any clumps with more vigorous stirring—since there’s not much water in the mixture yet you won’t work up a bunch of later. Add the remaining four ingredients one at a time, stirring between additions. That’s it! 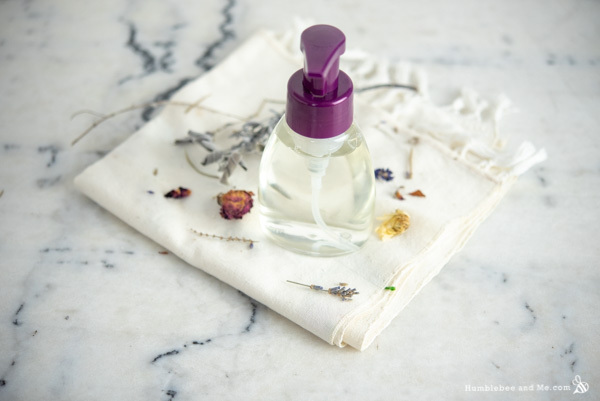 Decant into a 250mL/8fl oz bottle fitted with a foamer top (you need the foamer top!). I used a 250mL bottle with a purple pump from Windy Point—I love the variety of coloured pumps they have! To use, dispense some foam into your palm and use that to wash your hands as usual. Because this hand wash contains water, you must include a broad-spectrum preservative to ward off microbial growth. This is non-optional. Even with a preservative this project is likely to eventually spoil as our kitchens are not sterile laboratories, so in the event you notice any change in colour, scent, or texture, chuck it out and make a fresh batch. As I’ve provided this recipe in percentages as well as grams you can easily calculate it to any size using a simple spreadsheet as I’ve explained in this post. As written in grams this recipe will make 200g. If you’re like to use a different preservative, please review this page. 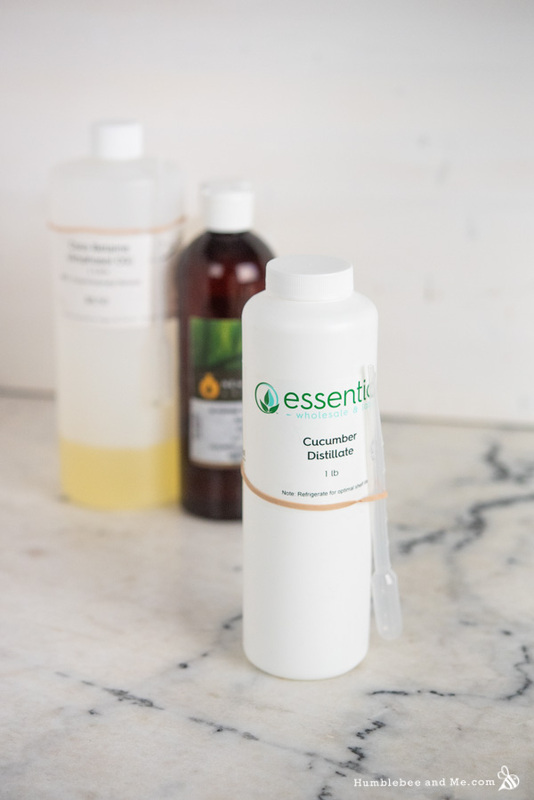 If you’d like to learn more about the surfactants used and compare them to ones you might already have so you can make substitutions, check out this page. The three key characteristics to look for are the format (you’ll want liquid for this recipe), active surfactant matter, and charge. 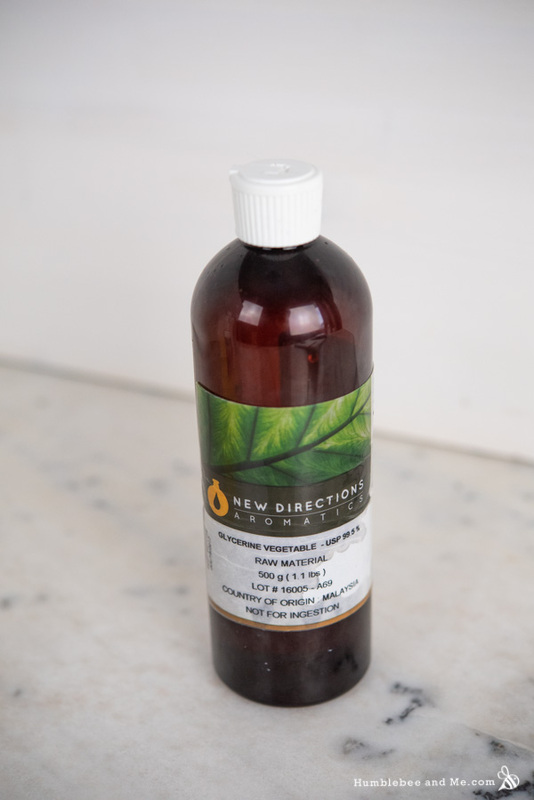 The pH of this hand wash comes out at about 5 if made as written; if you are making changes (especially to the surfactants) be sure to test and adjust back to around 5 if required. You could use a different hydrosol or distillate instead of cucumber for a different scent. If you do use a different one you may want to use more (using less distilled water to keep the recipe in balance). I find the cucumber distillate to be pretty strong, so I didn’t use much, but you might want to use more of whatever hydrosol you use instead. You could replace the aloe vera juice with more distilled water or a hydrosol. 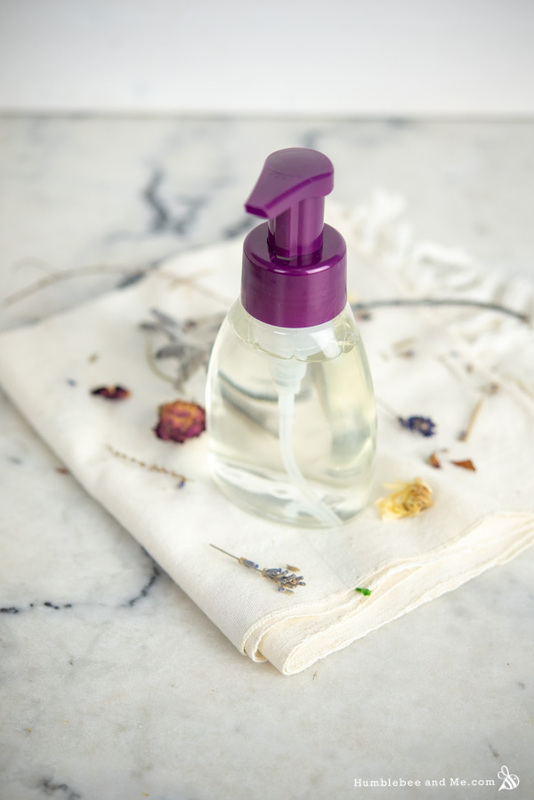 If you’d like to include a fragrance or essential oil you will need to incorporate a solubilizer as well. Remove 4% from the water and add 4% polysorbate 20; I found that will solubilize about 0.5% fragrance or essential oil well. Blend the polysorbate 20 and fragrance together in a small dish before incorporating into the rest of the project. The cucumber distillate was gifted by Essential Wholesale. Sounds super easy and cost-effective! Can this be used as a facial wash as well? Ooh, can’t wait. I just love this series! Great recipe, Marie. I’m going to try to make this with the cucumber glycerite I made. I’ve made a bunch of glycerites (rose, cucumber, vanilla, lemon) and so I’m excited to try using them in place of regular glycerine. Oooh, that sounds stunning! Let me know how it turns out—swoon! Whoa the cucumber distillate is crazy expensive. 113.00 for 16oz! Is there a difference between a distillate and a hydrosol? I totally agree. That price seems ridiculous. Try googling how to make it yourself. From what I can tell, there is no difference between hydrosol and distillate. I’ve read that the two terms are interchangeable. Wow this looks super soothing! Can’t wait to try. Thank you Marie! I live in Australia and i couldnt find “Sodium C14-16 Olefin Sulfonate (Bioterge AS40)”anywhere, I am new to DIY, would you please tell me what can i substitute it with, i couldnt find anything in your guid sheet that is liquid, has a similar PH and active matter! would really appreciate your help here. It’s hard for me to make recommendations without knowing what you can get. 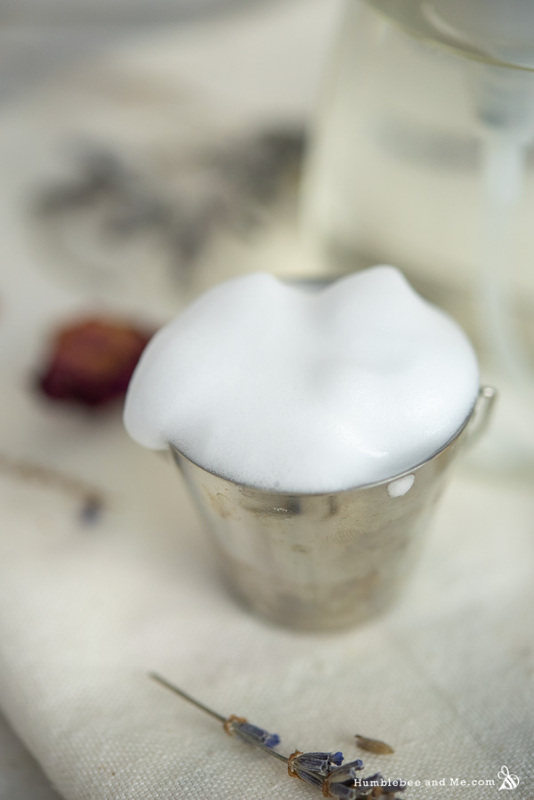 I did recently publish an entire FAQ on surfactant substitutions that might help 🙂 I’d also recommend looking at some of my other foaming hand wash recipes and seeing if any of them use surfactants you can get—I’ve done quite a few using several different types of surfactants! I want to use a fragrance oil, but don’t have poly 20, can I use poly 80 or turkey red oil? Polysorbate 80 would be my next choice 🙂 Check out this post to learn more about solubilizers!